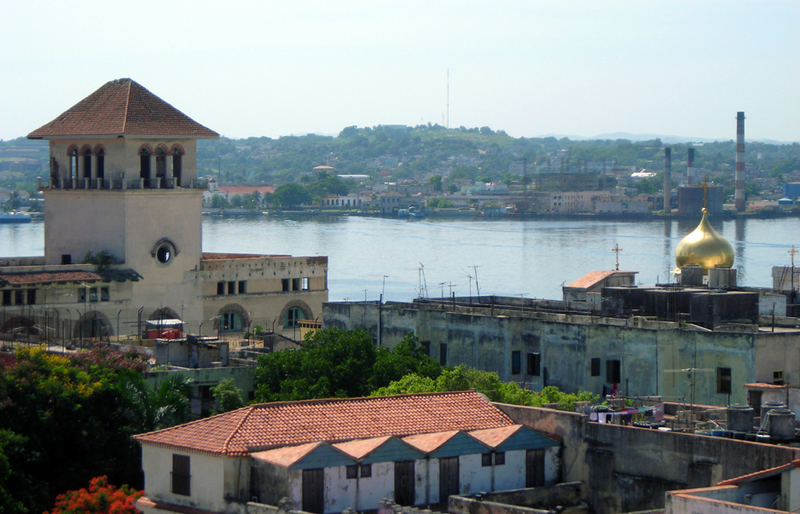 Until very recently, the only three legal ways for an American citizen to travel to Cuba were family, academic research, and humanitarian volunteer work. The tour group with which I traveled to Cuba officially fell into the latter category. The volunteer-oriented part of the scheduled turned out to be very minimal, however — only one hour of the entire week. Much more time was devoted to food activities and standard tourist sightseeing. The itinerary that was set up for us included several places I probably would not have chosen, but that is a disadvantage of going with a group. 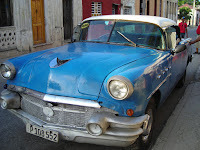 Our first outing was a day-long visit to Old Havana, which is a great way to get a feel for the history of the city. There's been a lot of restoration and conservation of the old buildings (with signage showing how they used to belong to wealthy individuals and now serve the greater good of the general population; gotta get that propaganda in). We saw a good number of the major highlights, including the Plaza de la Catedral, site of the cathedral dedicated to Saint Christopher, the patron of Havana (the cathedral is currently undergoing renovation and was not open); Plaza San Francisco de Asís (Saint Francis of Assisi), with the basilica dedicated to Saint Francis and also a statue of Father Junípero Serra, well known to Californians as the man responsible for founding ten Catholic missions in California; the Plaza Vieja ("Old Square"), the only plaza remaining from colonial times; and the Plaza de Armas (I might translate it as Military Square), near a fantastic flea market type of set-up with lots of booksellers (because the government ministry for publications is also nearby). Of course, that's when the tour guide suddenly decided we had to hurry, after lollygagging at several other locations. I did manage to squeeze out enough time to buy a Cuban cookbook (in French!) and a book about the history of clothing from a Cuban perspective. On the other hand, we also went to the Chocolate "Museum", which had a couple of display cases with unidentified items but was otherwise just a café selling chocolate-focused foods; the Cámara Oscura (at the Plaza Vieja), which provided a great visual overview of the city but also had a guide who made snarky remarks about Americans during his spiel (and then we were told to tip him anyway); and the Museum of Rum, which was kind of interesting, but the tour guide there didn't speak clearly, and I was told later that she was a friend of our guide, which explained why we were the only ones asked to give her a tip. On top of that, we were rushed out after the rum tour by our guide and not given a chance to buy any rum or cigars (only to be directed later during the week to a different store where the prices were twice as much, and our guide was heard asking the cashier how much members of our group were spending; can you say "kickbacks"?). One day we watched a cooking demonstration and ate lunch at a state-run culinary school. 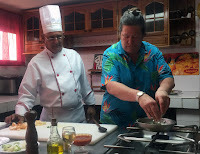 The demonstration was fun — I was the volunteer assistant — but the lobster at the meal was overcooked and rubbery for everyone, not a great recommendation for a cooking school. On top of that, the chef told us that the recipe for the entree was in the cookbook they had for sale. It wasn't, but we didn't discover that until several of us had already paid for the book. One morning we visited a coop organic farm. It's a self-governing community of people who are trying to find better ways to grow food and increase crop yields. They say they recycle or reuse everything, which is great, but I saw a lot of what looked like good fruit that had fallen to the ground and was just lying there, being allowed to rot. While I'm sure it will be used for compost, I wondered why it hadn't been harvested. We had a long lecture about Cuban political ideology (but more on that in my next post). This was also the location of our only volunteer activity; members of our group picked beans for about an hour. After leaving the farm, we ate lunch at a restaurant that appeared to cater exclusively to tourists. 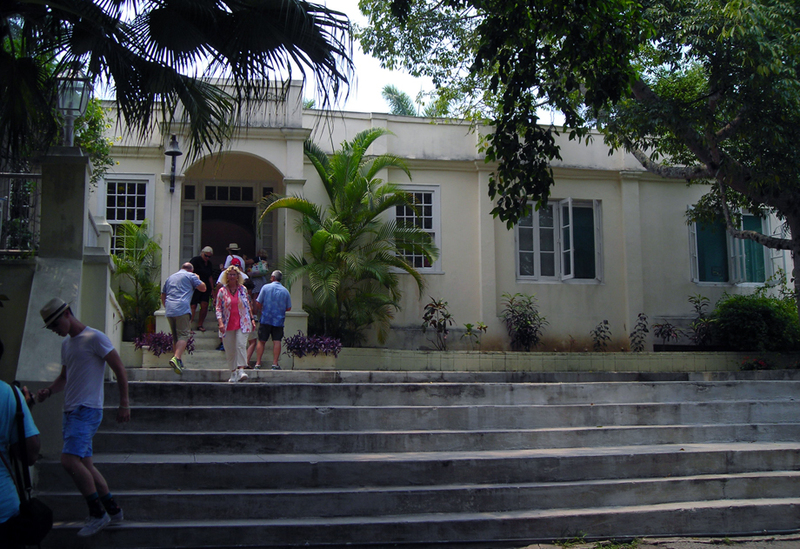 In the afternoon we spent a lot of time (maybe too much time) at Finca la Vigía, the former estate of Ernest Hemingway and now a museum where everything is supposedly exactly as it was the day he left (well, except for his boat, the Pilar, which was brought up from the water and put into permanent drydock; and the swimming pool, which has been drained; and who knows what else, because there's no documentation). As far as I could tell, all of the visitors were Americans. I took tons of photos there because my sister likes Hemingway, but I personally could have done without the visit, which had no interpretive or curated elements. It's on the tourist circuit because he was American and famous, not because it has much of anything to do with Cuba or Cubans. Half of one day was spent at an artist's studio where they have a great gig going — you pay them to visit the studio and eat lunch, plus they have you do work on an ongoing community art project. We were behind schedule when we arrived and therefore started our project late, so were unable to complete it. Because the project was specific to our group during this trip, it will likely remain unfinished. Personally (and I realize this will differ from person to person), I did not enjoy the art style, which is somewhat of a cross between primitive and Cubism. And we didn't even meet the artist. Earlier that morning we had visited a private farmers' market, even though we had been warned multiple times by the tour coordinator not to buy anything uncooked or to buy food off the street. Everything in the market was sitting out in the 90°+ heat, including raw meat (yum!). 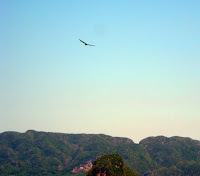 I don't think anyone bought anything, and just think, if we hadn't gone there, we probably could have finished our art project . . . .
An entire day (from 8:00 a.m. to 6:00 p.m.) was spent on a trip to the Viñales area, in the western part of the island (three hours by bus each way). The main attractions there were karst formations (mogotes) with limestone caves and a (very short) boat trip on a river that flows through some of the caves. This was enjoyable, even though I have been to larger caves before (such as the Jenolan Caves in New South Wales, Australia). I also had fun photographing the vultures that were flying around. Lunch afterward was very tasty and seemed to be authentically Cuban. A performance purporting to be a recreation of something from historical slave times might have been more plausible with information on the research, rather than just asking for money. Then, however, we took a side trip that cost an hour to see an unfinished, primitive (read: amateurish) wall mural at a location that appeared to be marketed primarily to get tourists to spend money on piña coladas. We were told that the mural was created to commemorate someone having proven that it was possible to travel by canoe from the mouth of the Amazon to Cuba. The reason he was trying to prove the canoe trip was possible was because he had a theory that Cuba was populated not by migration of native peoples from the Florida peninsula, about 200 miles away, but from the Amazon. I would be more willing to give some credence to that theory if I saw the research in a respected, peer-reviewed, scientific journal. The visit to a tobacco farm after that was much more educational. We learned about the five different types of leaves that go into a cigar, how the leaves are dried and prepared, how much of the crop the farmer is required to sell to the state (80%), and even what happens to leftover pieces of leaves. Then we saw a demonstration of rolling a cigar by hand, which was pretty cool. The cigar was rolled extremely tightly and showed great craftmanship. And then — of course — we were given the opportunity to buy cigars at a very special price. Supposedly cigars purchased there didn't count against the customs maximum, but I declared mine anyway, because they were the only ones I bought. And if you're interested in getting a genuine Cuban cigar from me (a plain-wrap Cohiba), let me know! 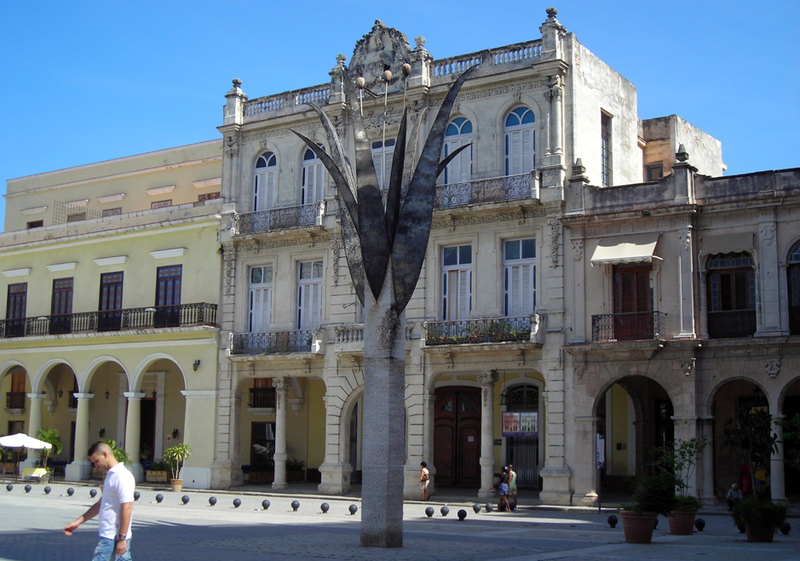 When free time was left in the schedule, most of the suggested activities were to go to expensive stores, restaurants, and clubs that cater to tourists, rather than to museums, historic locations, local restaurants, or other places that would give more of a flavor of the history and people of Cuba. The tour coordinator told me that previous groups had enjoyed those activities. I guess this group was not like those other people. Not only did we routinely decline to go to all the touristy places (the coordinator repeatedly told us we were missing great opportunities by not going; I guess she didn't want to go by herself), she had not included a visit to the Plaza de la Revolución in the itinerary, and we went because everyone in the group wanted to see it and specifically asked for it. Given my own license to choose, the Chocolate "Museum", artist's studio, farmers' market, and mural probably wouldn't have made it onto the itinerary. I was much happier with my own visits to the cemetery and to local bookstores and "flea markets." I even found a memorial to the victims of the 1898 USS Maine explosion (which precipitated the Spanish-American War). A quick glance in the Havana Páginas Amarillas para el Turista ("Yellow Pages for Tourists") in my hotel room showed me the Museum of Colonial Art, Museum of Railroads in Cuba, Museum of the City of Havana, and the National Museum of Fine Arts, all of which seemed far more interesting. The National Museum of the Literacy Campaign sounded intriguing (Cuba has almost 100% literacy), and the Napoleonic Museum would have been interesting. Ah, well, I guess those will also have to wait for my next trip to Cuba . . . .
My Cuban Adventure, Part 1, is "In Search of Family History." 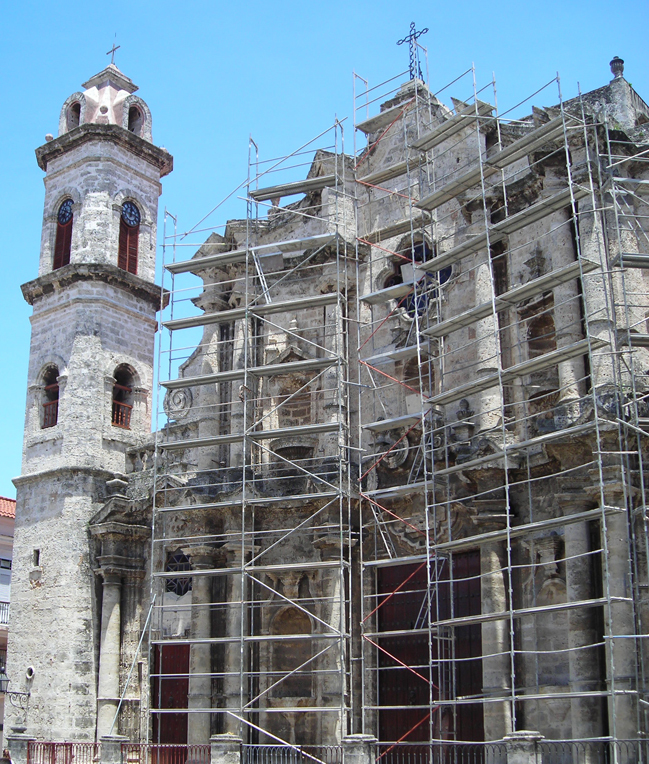 My Cuban Adventure, Part 3, is "General Impressions and Observations." For the past week I have been in Cuba. The organized group with which I traveled was (nominally) focused on volunteer humanitarian work (more on that later), but I went primarily because I wanted to do some family history research. 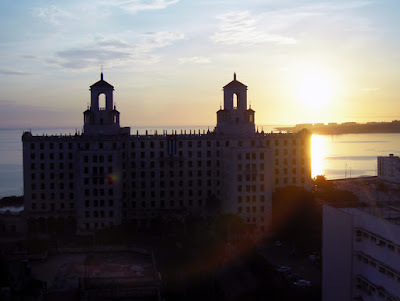 What with U.S.–Cuban relations thawing and the likely upcoming rush to make Cuba an American playground (again) by next year, I figured I should take the opportunity while I could, because soon the place is likely to be overrun with tourists. My research wasn't going to focus on people, because I have no relatives left in Cuba. The cousins who lived there emigrated soon after Fidel Castro came to power in 1959 (almost all of them) or some years later. Instead, I wanted to try to visit locations associated with family members, as no one has any photographs of any of those places. The one absolute success I had was finding the Patronato Synagogue in Havana, where cousins from the Jewish side of my family used to be members. I took photographs of the exterior and interior, and of plaques and photos inside. 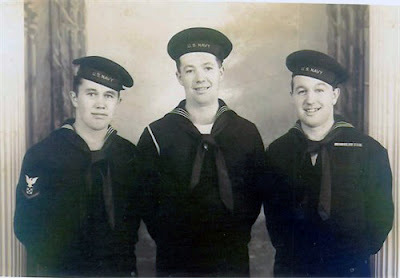 I also spoke with a very nice man who did not recognize the names of any of my cousins, but considering how long ago they left, I was not all that surprised. 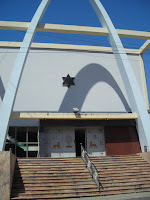 Later I was able to visit the Cuban Jewish Community center, which is next door to the synagogue. This time I met Adela Dworkin, the well known president of the synagogue. While speaking with her I discovered she knows one of my cousins, who was actively involved in the community. Adela remembers when the cousin moved from Cuba to Israel. It was nice to find a personal connection on my trip. I also had two old home addresses for this side of the family. 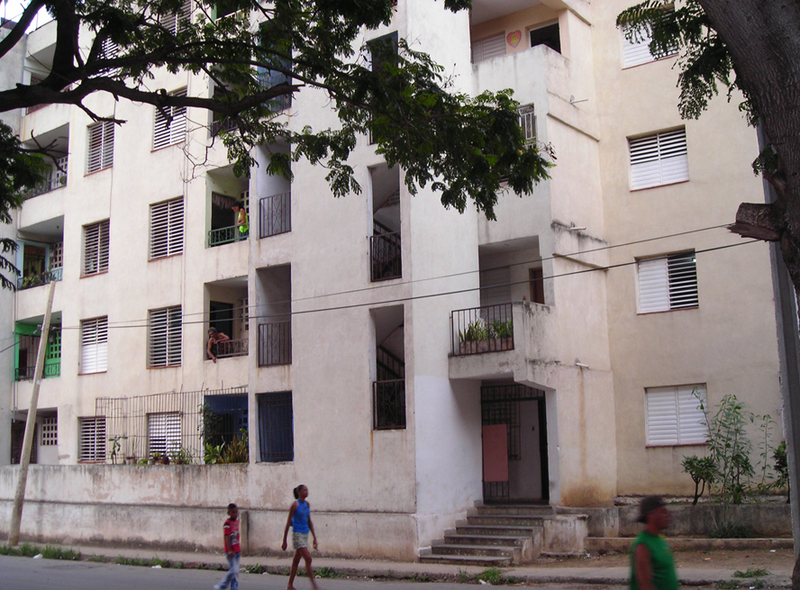 The one on Calle Hospital (Hospital Street) in Havana doesn't seem to have panned out — there's an apartment building there, but it looks very blocky and post-1959 to me (see that on the left?). I took a photo of it just in case, and also one of an older apartment building a couple of blocks up the street. I suspect where the blocky building is now there used to be buildings of the older type. I'm waiting to hear from my cousin to learn if either looks familiar. Looking for the other address proved to be one of the more exciting things I did while in Havana. Through my hotel's tourist information desk, I worked out an arrangement with Elaine, a hotel employee who happened to live in the same suburb (Guanabacoa) where the address is, to go with me and help me look for the building. I learned that maps are not commonly used in Cuba; most people get around by asking others for directions. So having someone who knew that area was going to be a big advantage. I arrived early for our scheduled excursion, because that's what I usually do. 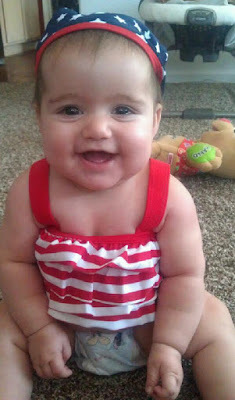 She was working on Caribbean time, however, and showed up almost half an hour late, causing me a little bit of stress. 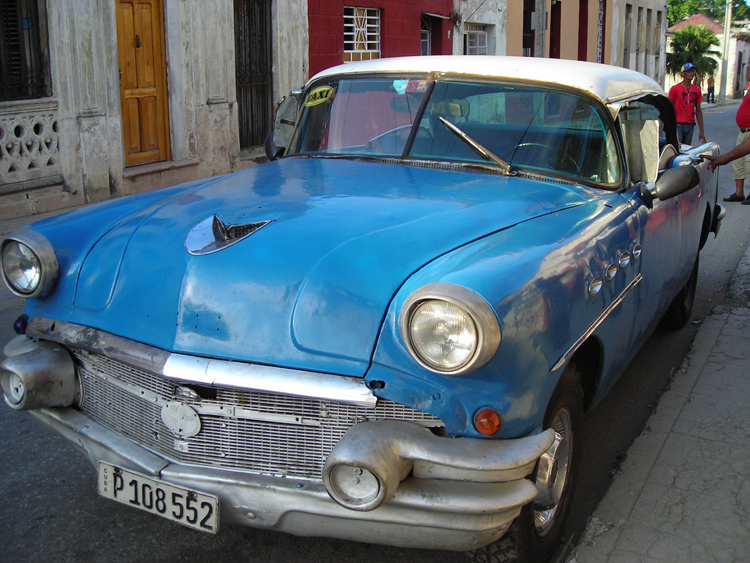 The taxi we took was a 1956 Buick Roadmaster, one of the classic old cars that Cuba is famous for. It had a Toyota emblem attached to the grill, a Ford gear shift, and a very modern pop-out digital radio. Heaven knows what kind of engine was under the hood — I was told that most of the old cars now have newer engines, because it's easier to keep them running. And off we headed to Guanabacoa, to the east and a little south of my hotel. On the way out of Havana we passed through an ominous-looking government checkpoint but didn't have to stop. 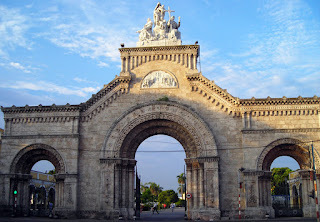 (I went through another of these checkpoints when my tour group took a day trip west of Havana. I'm willing to bet there's one in the south direction to match.) While the car belched gas and oil fumes (maybe this one had an old engine after all? ), the driver tried to avoid as many potholes as possible, but there were just too many, and he still hit quite a few. After half an hour of this entertainment, we reached Guanabacoa, and Elaine gave the driver instructions to find Estrada Palma (Palm Street), the street we were looking for. When we found it, we of course turned the wrong direction. After about six blocks of watching the house numbers go up instead of down, we turned around and headed back. We eventually found #59, an apartment building with a ground floor and two upper stories with apartments. Elaine asked the neighbors and some women walking out of the building if they recognized my cousins' family name, which no one did. But one woman from the apartment building invited us to come upstairs and look around. She let us visit her apartment and allowed me to take photographs of the rooms. I checked the door frames of all ten apartments (five on each floor), and none had even a vestige of a mezuzah having been hung there, but it has been more than 60 years. The woman was pretty sure the building had been there in the 1950's, so I think it's the right place, but I'll be checking with my cousin about this one also. Another cousin, this one on my non-Jewish side, used to live in Cuba, but just to be different moved there after Castro. Her then-husband decided he was a Communist, and they moved so he could participate fully as a party member. Apparently things didn't turn quite out as he had expected, because they moved back to the U.S. within a couple of years. 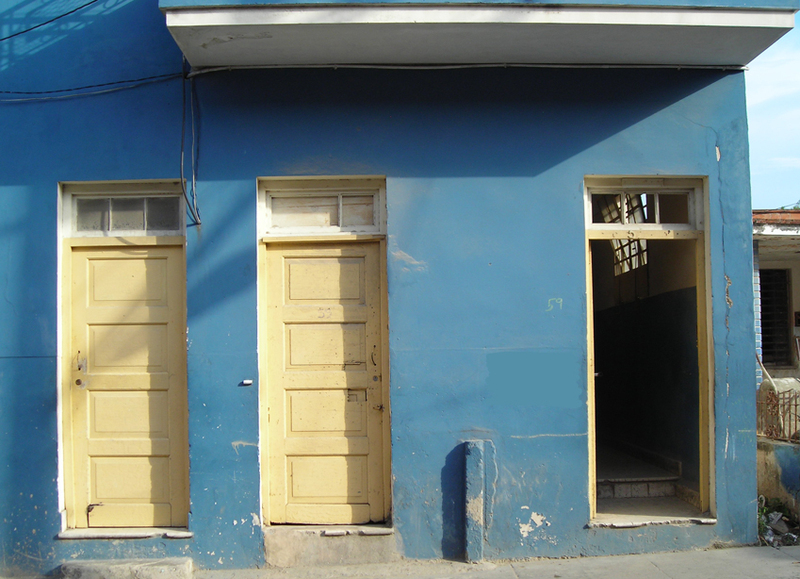 I wanted to try to find the house where they had lived, which my cousin remembered was in Mariel la Boca and near a women's prison, but she couldn't find the address anywhere. The closest I came was seeing a sign for the town from the highway. Cemetery), a huge Catholic cemetery more than 50 city blocks in size. I had seen the entrance earlier during the week and knew I had to visit it before I left. 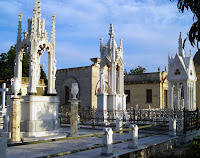 Beautiful monuments and mausolea are everywhere. Although the tombstone style looks like they're above-ground burials, as in New Orleans, I was told they're actually below ground. 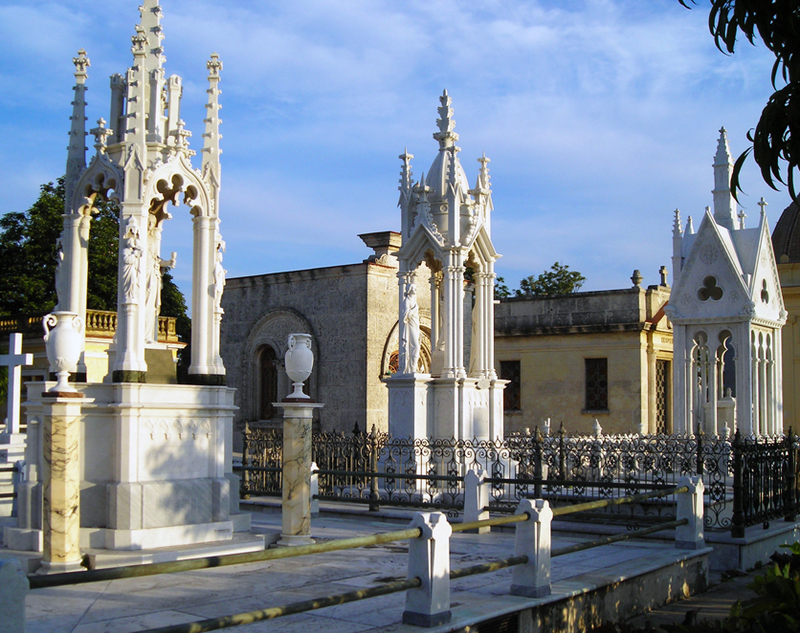 The large memorial tombstones are simply an ostentatious way of showing respect for the dead, apparently from a Spanish custom. (I was also told that after a few years the bones are moved from the graves to an ossuary, because families are large and there is always someone else to bury in the family plot.) The most interesting mausoleum was as big as a house. It's for people who came from the same town, rather than being for one family. 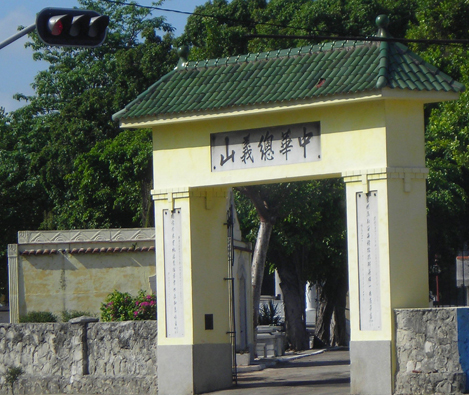 Mausoleum for "Naturales de Ortigueira"
Near Necrópolis de Colón is a Chinese cemetery, whose entrance I saw the same day earlier in the week. 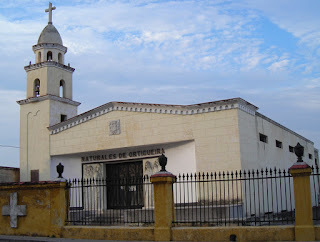 I ran out of time to visit it on Saturday morning because it appears to be on the far side of Colón and I had already walked a few miles, but I did manage to take a photo while the tour bus was waiting at a red light. I didn't find the Jewish cemetery on this trip; I guess I'll have to come back! 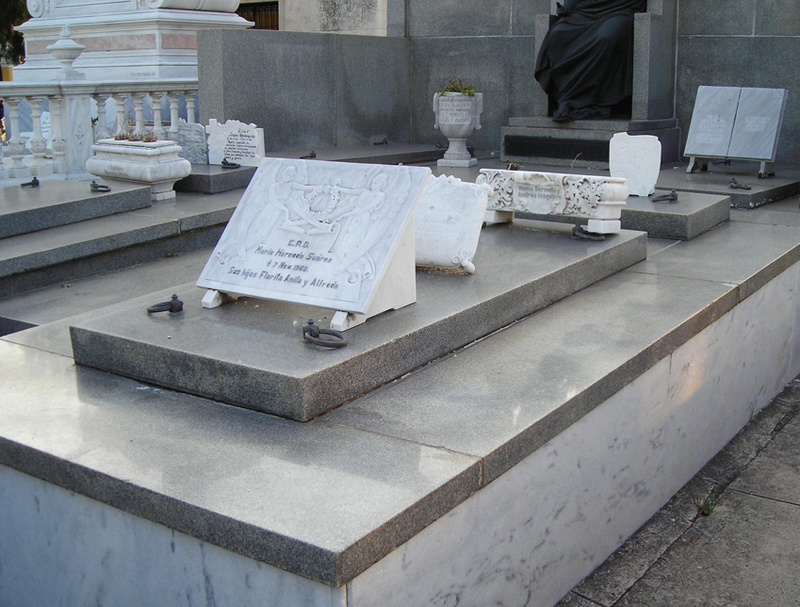 While I was strolling through Colón, I wondered if a complete list of all the interments and/or the tombstones exists. Somehow I doubt it. Wouldn't that be an interesting project for FindAGrave? 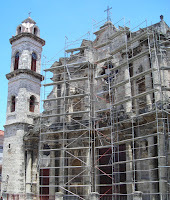 My Cuban Adventure, Part 2, is "Seeing the Sights." Have you ever heard of Jean Léon La Forêt? I hadn't either, until a couple of weeks ago. That's when a fellow genealogist in the Bay Area tracked me down in the Oakland FamilySearch Library and walked over with a bulging bag in her hand. "Do you have a minute? I have something I want to show you." The bag contained two boxes, two notebooks, and two scrapbooks full of photos, documents, and a mystery. The cast of characters includes Mr. La Forêt and Emma Margaret (Schaefer) La Forêt, Earl Elden Cobb and Rosita (La Forêt) Cobb, John Schaefer and Elizaeth (Walz) Schaefer, and many more. Locations include Algeria, France, Switzerland, the United States. Accusations appear to include child neglect, theft, swindling, and possibly murder. About 1865, John Schaefer married Elizabeth Walz. They had at least one child, Emma Margaret Schaefer. Mr. Schaefer died suddenly in 1867 without having written a will. As was common at the time for widows with young children, Elizabeth remarried, this time to Mr. Curdt. He seems to be the villain in this story. Poor Emma Margaret is said to have been mistreated and frozen out of her inheritance, with the assistance (deliberate or unintentional? as yet uncertain) of her mother. She ran away into an early marriage, to Mr. Petit. That apparently didn't work out. Later she married Jean La Forêt, who might be the hero of the piece. He was a former Marine (because there is no such thing as an ex-Marine) and a Vice-Consul in Algiers (at different times, of course). They had one child, Rosita. Elizabeth later died in a suspicious fire. There are copies of wills and probate proceedings. Originals of deeds and naturalization documents, State Department and U.S. Senate letterhead, newspapers and clippings, business and calling cards. Lots and lots of notes. This interesting package was donated several years ago to a local society, but no one there really knew what to do with it. One person decided to take it home and try to piece everything together and make a narrative, but other things always took priority, and it sat in the back of a closet. And then suddenly she came up with the idea of giving it to me. (Remember the old Life cereal commercial? "Let's get Mikey!") She said she thought I could do the mystery justice. So how could I turn it down? It has certainly tickled my curiosity bone! The first thing I'm going to have to do is look through all the items and figure out a logical way to sort them, so I know what I actually have. Normally the order in which items are kept is important, but these have changed hands enough times that any original sequencing appears to have been lost. Then I'll start analyzing everything. I plan to post updates as I work through the documents. I don't know if I'll find an answer to the questions the first collector posed, but it should be an interesting journey. Did you participate in FamilySearch's 2014 Worldwide Indexing Project? That was an organized effort to have as many people transcribe (because the volunteers aren't actually doing any "indexing") at least one batch of records from FamilySearch over a two-day period. This year the effort is being called the Worldwide Indexing Event, it has been extended to one week (August 7–14), and the goal is to have 100,000 volunteers submit at least one batch each. Remember, all of the free searchable databases on FamilySearch.org are there because volunteers donated their time and transcribed digitized microfilm. This year there is a particular emphasis on transcribing records in languages other than English. We're talking about having a group of staff members come in to the Oakland FamilySearch Library for another brunch and indexing party, as we did last year. Why not get your friends together and do the same? I hope we have chocolate again! The Sydney Jewish Museum and the Netherlands' Anne Frank House are searching for letters from Otto Frank, father of Anne Frank. The father of the famous diarist received a large amount of correspondence in the years following the English publication of The Diary of Anne Frank. Most were written by girls the same age as Anne or older. 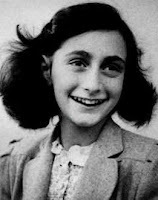 While the Anne Frank House has retained all the letters sent to Otto, his replies were not copied or archived. If you or someone you know wrote to Otto Frank and still has his letter written in response, please contact Anne Slade in Australia at 0418 670 352 or by e-mail. 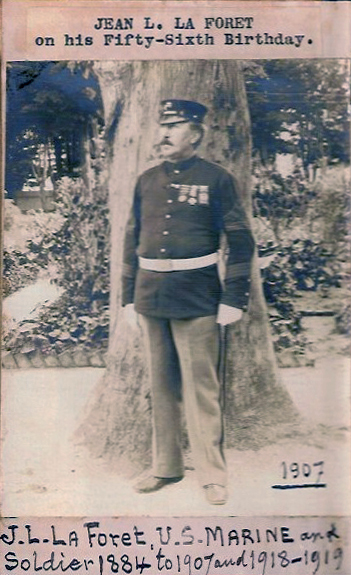 Dr. Wilhelm Solf was the first governor of German Samoa and later was the German ambassador to Japan under the Weimar Republic. After his death in 1936, his widow, Johanna Solf, presided over the Solf-Kreis, a circle of anti-Nazi intellectuals, in her salon in Berlin. Solf and her daughter, the Countess So'oa'emalelagi "Lagi" von Ballestrem-Solf, hid many Jews and provided them with documents to emigrate to safety. Most members of the circle were arrested and executed after attending a tea party in Berlin on 10 September 1943. 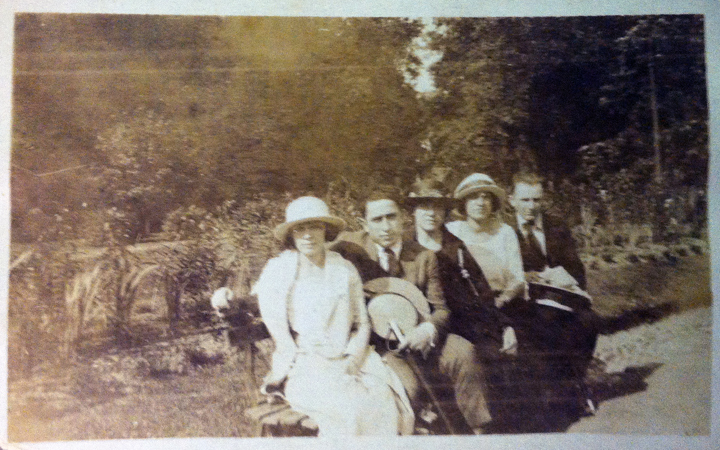 The guests had been betrayed by a Gestapo spy. The Solfs were interned in Ravensbrück and narrowly avoided death because of delays in their trial and the subsequent approach of the Red Army, which led to their liberation. Now, New Zealand author Michael Field is seeking survivors or descendants of survivors who escaped the Holocaust through the Solf Circle. Michael wants to tell the story to a wider English-speaking audience and is seeking more information. Anyone with information should e-mail him. The short-lived Macclesfield Hebrew Congregation flourished from 1941–1946 in Cheshire, England, following the arrival of evacuees, refugees, and firms which moved up from the London area. 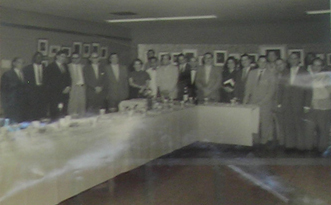 The firms included Belmont Textiles (the Belmont/Lazarus families), Osband Knitwear, Offenbach, BJ Friend, H&I Franklin, V&E Friedland, A. Goldstein, and possibly Halle. 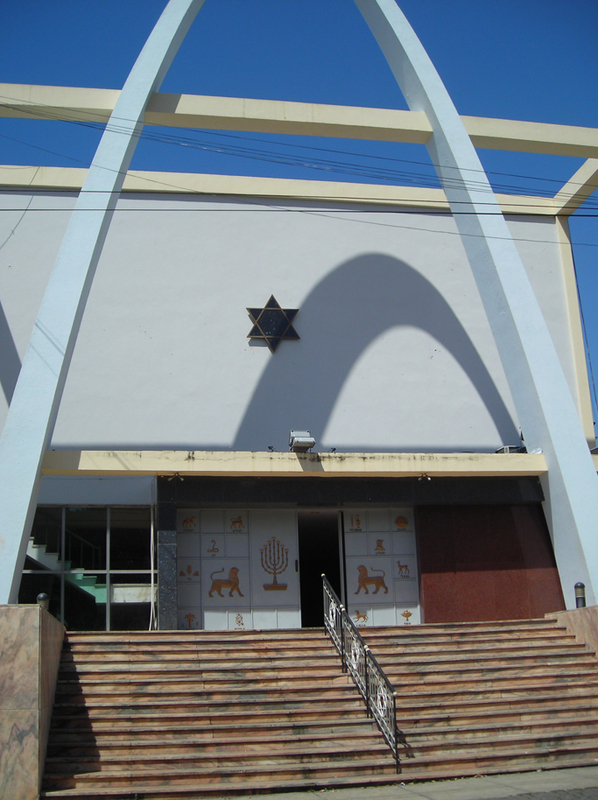 The congregation was the most northerly outpost of the United Synagogue and had its own rabbi as well as its own branch of the Women's International Zionist Organization. Jonathan Kaplan, a first-year Ph.D. student at the University of Technology in Sydney, New South Wales, Australia is focusing his research on the social, sartorial, and aesthetic roles of Jewish men in Vienna (and other towns in cities in the former Austro-Hungarian Empire) during the late 19th and early 20th centuries (roughly 1890–1930). He is trying to create a digital database of photographs and ephemera from this era for his research. If you have family photographs, advertising materials, or other relevant items that you are willing to share with Jonathan, please contact him. It's time for another round-up of the latest additions to the Wikipedia online newspaper archive page! Advantage Preservation has been on a binge of digitization lately, so more newspapers seem to be coming online every day, which is great for us researchers. And almost all the new links are free, which is even better. Belgium: The Bibliothèque Royale de Belgique (Royal Library of Belgium) has uploaded free digital images of newspapers dating from 1831–1918. The site is in French, Dutch, and English, and some of the newspapers are in German. Newspapers from 1919–1950 are indexed and appear in search results, but due to copyright issues, those images are not free. Canada: I found a trove of Mennonite links. There are links to indices for death notices and obituaries in five Mennonite newspapers, and an author/subject index for one of the newspapers (which was published in in the United States for a time and so also shows up in the Multistate list). China: The Shanghai Echo, a periodical for Jewish refugees who had fled Europe, is online for 1946 to 1948. England: The Foxearth and District Local History Society has posted transcribed selections from newspapers in the East Anglia area. England: Spare Rib, a feminist publication, has been digitized and uploaded in its entirety. England: A book was published with a detailed index of The (London) Times of 1863, and that book is available online as a downloadable PDF. Ireland: Ancestry.com has created a new newspaper site, IrishNewspapers.com. I wonder if this means it's trying to go back to the pricing model it used to have, where you could pay for different databases separately. Poland: There is an index to death notices published in Nasz Przegląd ("Our Review"), a Polish-language Zionist newspaper that was published daily in Warszawa from March 1923 until August 1939. Russia: This is another Mennonite resource. Someone created an index of Mennonite-relevant stories in the German-language Odessaer Zeitung ("Odessa Newspaper"). California: The Genealogical Society of Santa Cruz County has an index to early local newspapers, available as PDF files. I don't see that the index tells you which paper an entry is from, but maybe I'm just overlooking it. Georgia: The Uncle Remus Regional Library System, which covers six counties (but not the ones I'm researching, of course), has several newspapers available online, courtesy of Advantage Preservation. Indiana: The New Albany–Floyd County Public Library has an index to local newspapers for 1847 to the present. Indiana: The obituary index for the Plymouth Pilot Daily is downloadable as several PDF files. Iowa: Ten newspapers from Dickinson County have been digitized by Advantage Preservation. Massachusetts: The first 30 years of the Boston Jewish Times are available courtesy of the American Jewish Historical Society. Michigan: More than one million subject index cards from the Detroit News are available on the Seeking Michigan site. 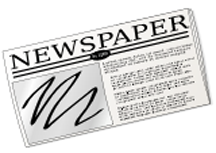 Michigan: The Milford Public Library not only hosts an obituary index for the Milford Times for 1929–1949, but they will provide you a free copy of the obituary when you find one you want. Michigan: This one's a little unusual. A cemetery has the local newspaper, the Petoskey News Review for 1874–2001, on its site. Montana: The student newspaper for Bozeman High School for 1939–2015 is available online, courtesy of Advantage Preservation. Montana: Montana State University is in the process of placing digital copies of its student newspaper, the Exponent, online. Not everything is there yet. Nebraska: Advantage Preservation worked with the North Bend Public Library to digitize three local newspapers there. New Jersey: Ten early Plainfield newspapers running from 1837–1918 are on the Plainfield Library's Web site. New Jersey: The Rockaway Township Free Public Library has the Iron Era and Rockaway Record available online. 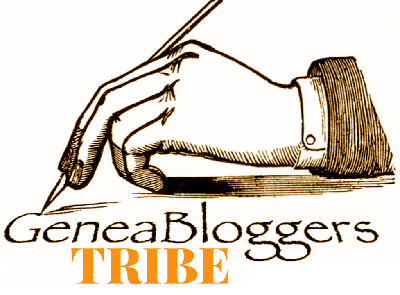 New York: Allegany Public Library and Advantage Preservation teamed up to put four Allegany newspapers online. 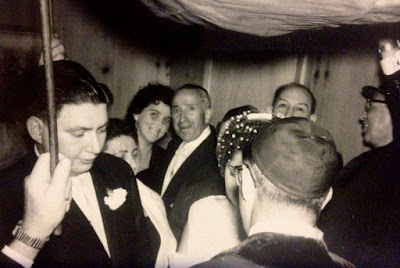 New York: The Troy Irish Genealogy Society has added a marriage notices index to complement its Lansingburgh newspapers death notices index. North Carolina: The Duke Chronicle, the student newspaper for Duke University, is online but only for the 1960's and 1980's. Ohio: A collection of newspapers printed by the Wright Brothers has been digitized and is available on two sites, Dayton Metro Library and Wright State University. Tennessee: An obituary index for the Nashville Tennessean for 1964 to the present is on the Nashville Public Library's site. Multistate: The American Historical Society of Germans from Russia hosts an index for about 200,000 obituaries. There is no indication on the site what years this covers. Multistate: MennObits has transcribed obituaries from Mennonite newspapers from 1864 to the present. I hope you find some great information in at least one of these newspapers!